Heading into the 2009 season, only four drivers in the history of the World of Outlaws had won at least 100 career A-Feature events. Donny Schatz added his name to this illustrious list on Saturday night in his home state of North Dakota, picking up the monumental win at Dacotah Speedway in Mandan, to join Steve Kinser, Sammy Swindell, Doug Wolfgang and Mark Kinser as the only drivers to accomplish this feat in the 31-plus year history of the series. Schatz took the lead from Danny Lasoski on the 23rd lap coming off the fourth turn and would pace the field for the remainder of the 35-lap contest to pick up his 12th win of 2009. It was his first career win at Dacotah Speedway in his second start at the high-banked 3/8-mile. For Schatz, it was his second win of the 2009 season in his home state, with the other coming at River Cities Speedway back in June. In his career, the native of Minot who now calls Fargo home has won four times in North Dakota. The win also helped him extend his lead in the series championship standings as he chases his fourth consecutive title aboard the Armor All J&J. Schatz picked up his first career win with the World of Outlaws at Cottage Grove Speedway, which was at the time called Riverside Speedway on August 24, 1998. He vividly recalls that day when he picked up that win over three Hall of Famers, with Jac Haudenschild finishing second, Sammy Swindell third and Steve Kinser fourth. 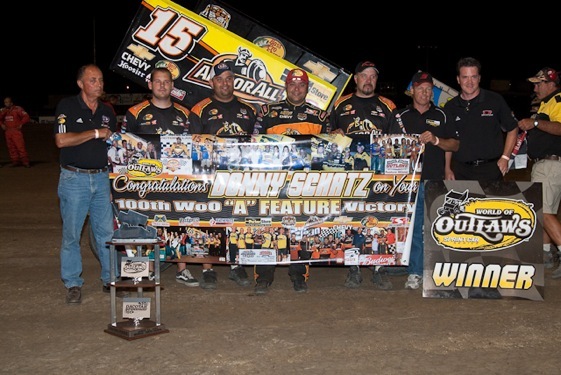 Over the last 11-plus seasons, Schatz has now won A-Feature events at 50 different tracks with the World of Outlaws. The race began on Saturday night with Sam Hafertepe Jr. leading the field into turn one, with Danny Lasoski blasting around him in turn two to take the top spot. Jason Meyers moved into second at this point, with Hafertepe retaking that spot by the time the pair got back to the start/finish line. Schatz, who started fifth and Meyers who started third, would trade the third spot a number of times in the early going. Lasoski began to pull away at this point as he neared lapped traffic. Joey Saldana had just worked his way into third on the fourth lap went off the track on the back straightaway, but kept the car rolling and came back on the track and rejoined the field in the eighth spot. Hafertepe began to gain some ground on Lasoski in heavy traffic on the seventh lap along with Myers. Meyers took the second spot on the ninth lap, but that lap was negated by a caution. Lasoski led on the restart and quickly jumped to an eight-car length lead, with Meyers battling Hafertepe for the second spot. The leaders worked traffic during the middle portions of the 35-lap contest. Hafertepe took the lead lap-16 in turn three in traffic, only to have Lasoski take it back in nearly the same spot on the next lap. Meyers closed in on Lasoski on the 18th lap. Schatz closed back in on Meyers at this same time and the pair continued to battle with Schatz taking the second spot on the 21st lap. The next lap he would take the lead coming off turn four on the low side. Lasoski, who won earlier this season in North Dakota at Nodak Speedway, would finish second in the Casey’s General Store JEI. He began the night by blistering the existing track record by nearly two second in time trials to set a new mark. After getting caught up in a first lap accident on Friday night at River Cities Speedway, Jason Meyers’ team built a brand new car for Saturday’s race and that hard work paid off as the California native finished third in the GLR Investments KPC. He remains second in the series standings as he chases his first title. Sam Hafertepe Jr. finished fourth in the G.H. Plumbing Maxim after winning the Crane Cams Dash to start on the pole, as he continues to close in on his first World of Outlaws win. The native of Sunnyvale, Texas ran third last month in the Kings Royal at Eldora Speedway and prior to that led a number of laps in the Brad Doty Classic at Limaland Motorsports Park in Ohio. He led one lap on Saturday night. Joey Saldana worked his way back to fifth after his off track excursion aboard the Budweiser Maxim. Steve Kinser was sixth in the Quaker State Maxim, with Jason Sides seventh piloting the Wetherington Tractor Service Maxim. Tim Kaeding was eighth in the DTR Transport KPC. Jac Haudenschild charged back to finish ninth in the Owens-Corning Fiberglass Maxim after going off the track in turn three. Lucas Wolfe rounded out the Top-10 in the Allebach Racing Maxim. The World of Outlaws return to action with the third annual Oil City Cup at Castrol Raceway in Edmonton, Alberta, Canada on Friday, August 28 and Saturday, August 29. • FAST QUALIFIER: Danny Lasoski paced the 26 cars that took time with a record setting AMB i.t. timed lap around the high-banked 3/8-mile oval at 12.705 seconds at 106.257 mph. For his qualifying effort, Lasoski earned five bonus points. The next four fastest qualifiers also earned bonus points, including: Steve Kinser (4), Kraig Kinser (3), Jason Meyers (2), and Sam Hafertepe Jr. (1). • QUALIFYING WINNERS: Donny Schatz, Tim Kaeding and Jason Sides won heat races. Sam Hafertepe Jr. won the Crane Cams Dash. Chris Shirek won the B-Main. • FEATURE WINNERS: There has been 50 World of Outlaws Sprint Car Series A-Feature event held in 2009. The winners include: Joey Saldana (Volusia Speedway Park, Silver Dollar Speedway, Thunderbowl Raceway, Lone Star Speedway, Houston Raceway Park, The Dirt Track @ Lowe’s Motor Speedway, Virginia Motor Speedway, Lawrenceburg Speedway, Dodge City Raceway Park-twice, U.S. 36 Raceway, 34 Raceway and I-55 Raceway), Donny Schatz (Volusia Speedway Park-twice, The Dirt Track at Las Vegas Motor Speedway, Knoxville Raceway, Eldora Speedway, Canandaigua Speedway, Lawrenceburg Speedway, River Cities Speedway, Cedar Lake Speedway, Eldora Speedway, K-C Raceway and Dacotah Speedway), Danny Lasoski (Delaware International Speedway, Nodak Speedway, Eagle Raceway, Charter Raceway Park and Lernerville Speedway), Jason Meyers (Silver Dollar Speedway, Paducah International Raceway, I-96 Speedway, Red River Valley Speedway and Ohsweken Speedway), Craig Dollansky (Lebanon Valley Speedway, I-55 Raceway and River Cities Speedway), Greg Hodnett (Williams Grove Speedway-twice), Steve Kinser (Tri-State Speedway and Limaland Motorsports Park), Terry McCarl (Knoxville Raceway and Eldora Speedway), Dale Blaney (Attica Raceway Park), Randy Hannagan (Thunderbowl Raceway), Tim Kaeding (Riverside International Speedway),Chad Kemenah (Manzanita Speedway), Jason Sides (Ohsweken Speedway) and Stevie Smith (Lernerville Speedway). • 3/8-MILE WINNERS: Dacotah Speedway is a high-banked 3/8-mile oval. The World of Outlaws have raced 13 times on a track that size this season. The winners include: Joey Saldana (Lawrenceburg Speedway, Dodge City Raceway Park-twice, U.S. 36 Raceway and 34 Raceway), Donny Schatz (Lawrenceburg Speedway, Cedar Lake Speedway, K-C Raceway and Dacotah Speedway), Jason Meyers (Paducah International Raceway and Ohsweken Speedway, Danny Lasoski (Nodak Speedway) and Jason Sides (Ohsweken Speedway).